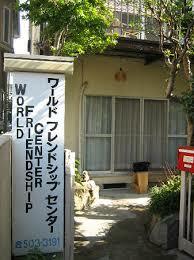 and a place where local Hiroshima residents volunteer their hospitality in a variety of peace activities. Become a member if you are interested in efforts to reach out in peace! You will receive information from WFC. You will receive an accommodation discount. You will be able to join PAX (Peace Ambassador Exchange Program). Only the support of many people through donations and memberships enable us to continue our work. With the exception of paid bilingual staff, all of the work done at WFC is on a volunteer basis. The Co-Directors, the board, the Hibakusha, and the Peace Park Guides all volunteer hundreds of hours of service to the Center out of a deep commitment to help the world understand that the only path to survival for the human race is one of peace and reconciliation. WFC receives no government or corporate support except from occasional grants. Join our activities and invite a friend. Suggest a topic you would like to discuss or present. Accept opportunities for volunteering at the center. Become a member of WFC.